Camouflage Military themed bounce house. Please note area required for setup is 20'x 20'. Height requirement is 13'. Actual Size: 17'L x 16'W x 12'H. 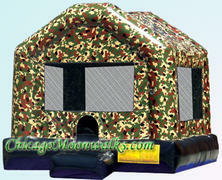 View our entire selection of Camouflage Military Themed Inflatable Jumpers, Combos, Slides, and Obstacle Courses.